Benedict never thought he'd become a hermit or a monastic but he did both. All he meant to do when he left Rome around the year 500 A.D. was to leave behind a society that simultaneously repulsed and enticed him.There was much left behind in Rome that called out to him and offered him a life of relative ease and comfort instead of a life of discipline in the wastes.But, Benedict knew the comforts of that world for what they were--the wreckage of a society adrift from God--and he knew the voices of his friends and colleagues calling him back to Rome for what they were--sirens leading him back to the rocks that had wrecked so many before--as well. So, although he was the son of Roman nobility and, therefore, in line for a career as a man of influence and prestige, he took stock of what the world had to offer and weighed it against what the Kingdom of God had to offer. On one side he saw a life that included not only the free pursuit of pleasure but, also, the ever haunting possibility of heartache. He knew well the pleasures and joys of the life of an affluent young man but on the other side he saw a life of discipline and renunciation with the pervasive promise of life. He didn't think the decision was very hard to make and so he set out for the desert to escape temptation and discover life more abundant. Later, he would be followed by his twin sister Scholastica, but that first day he went out alone into the unknown in pursuit of God's wild call and furious love. 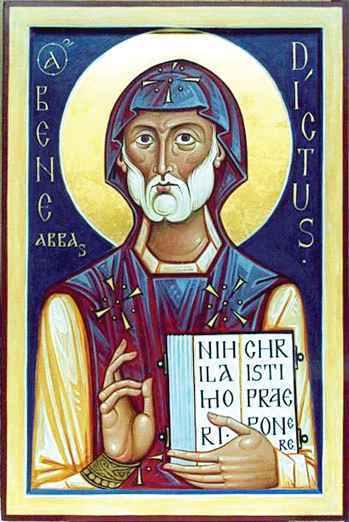 Benedict's fame only spread further into the surrounding countryside and soon there were monastics and lay people seeking to become novices seeking him out at his cave. Benedict knew that God had placed a call upon his life and so he submitted once again to the mantle of leadership and spiritual direction. He founded twelve different monasteries--each group having twelve members and one prior--of which he was the abbot. 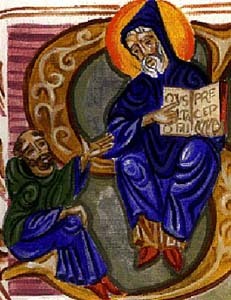 He built a smaller thirteenth monastery where he remained with a small collection of followers who received their instruction directly from Benedict. This small group changed often since the men and women who came into contact with Benedict's disciplined spiritual life found themselves propelled into disciplined ministry of their own--it was as if his "Rule" was contagious and proximity to Benedict developed spiritual leaders. He taught his many disciples to follow a rule that was easily summarized by the phrase ora et labora--pray and work. He spent the remainder of his life passing on the life of disciplined adherence to Christ's calling and devotion and loyalty to the Kingdom that had called him out of Rome.